Cupping therapy has been utilized for thousands of years in China and other countries to help move blocked qi (chee), energy, out of the body. Cupping releases rigid soft tissues, drains excess fluids and toxins, loosens adhesions, lifts connective tissue and brings blood flow to stagnant skin and muscles. The marks that are sometimes seen after a cupping session are NOT bruises, but rather are the toxins that have come up to the level of the skin. Myofascial release is direct, and correct applications addresses a myriad of debilitating and stubborn conditions. Cumulative treatments restructures myofascial bands as well as provides excellent lymphatic drainage. A cupping treatment consists of magnetic cups being applied to specific areas of the body for 10 to 30 minutes, depending on your needs. Stationary cupping is often followed by gliding cupping (cupping massage). Warmth and or tingling may be experienced as the qi (chi) moves through the body. Cupping assists in removing both tension and toxins from the body and relieving pain in the muscles of your body. Note: When needed, acupuncture is included in a session. This does not affect the above prices. When you come for your first cupping session you will be asked to fill out an intake form. Your condition will be discussed in detail. You will undress and lie on the massage table under the sheet/blanket. Nourishing, high quality oil is applied to the area being worked on. The appropriate cups will be applied as needed. The cups will remain in place for 10 - 15 minutes, depending on the issue. The cups will then be removed. Typically moving cup therapy is applied next to deal with your particular needs. 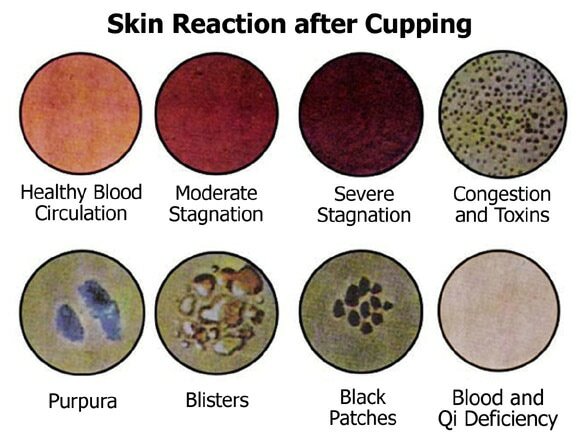 ​Cupping is contraindicated in cases of severe diseases, lesions, bulging discs, injection sites, organ failure, ascites due to hepato-cirrhosis and severe edema, as well as hemorrhagic diseases such as allergic pupura, hemophilia and leukemia, and clients with dermatosis, destruction of skin, or allergic dermatitis. Cupping should not be applied on the portion where hernia exists or has occurred in the past. For pregnant women, the lower abdomen, medial leg and sacral region should be avoided.